Billingham-based pump specialist Tomlinson Hall, in conjunction with Grundfos Pumps Ltd – part of the globe-spanning Grundfos Group – has announced that it is rolling out free Energy Checks across the UK. The audits, which have been developed by Grundfos, are designed to help pump users identify significant cost savings, comply with energy saving regulations and help them to reduce their carbon footprints. The Energy Check – which includes a detailed on-site audit – establishes a pump system’s current operation and registers information on pump types, age, flow, head and power usage, and the inspection requires no down time. In 2016 Tomlinson Hall was chosen by Grundfos to become a UK partner in its Industry Partner Global Initiative. Tomlinson Hall was one of only 40 partner companies in the world identified by Grundfos to have the necessary qualifications and capabilities to carry and promote the company’s brand ethos, and its commitment to innovative pump technology and energy saving solutions. A joint-founding member of the Pump Distributors Association, Tomlinson Hall is an approved global distributor of many leading pump brands and offers a total service to industry – including pump selection and supply, site visits, problem solving, servicing and repairs. 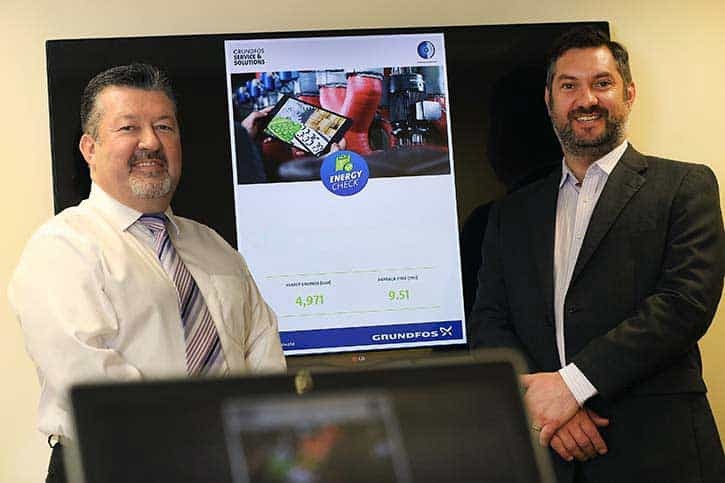 Colin Simpson, business development director at Tomlinson Hall, said: “Grundfos is a true innovator in the pump industry and by developing the Energy Check initiative, it has again demonstrated its commitment to sustainability and reducing energy use in industry. We’re proud to be partnering with Grundfos to deliver this initiative nationally as we believe that it will make a major long term impact on helping pump users to save costs, meet their environmental commitments and improve operational efficiencies. Rick Child, energy optimisation business development manager at Grundfos added: “Our experience is that such audits frequently unearth significant savings. Tomlinson Hall is the current holder of the Pump Industry Awards’ Distributor of the Year title and in 2017, the firm won the North East Process Industry Cluster SME of the Year Award for the second time. The Grundfos Group, founded in Denmark in 1945, has an annual turnover of £3 billion and produces 16 million pumps per year.